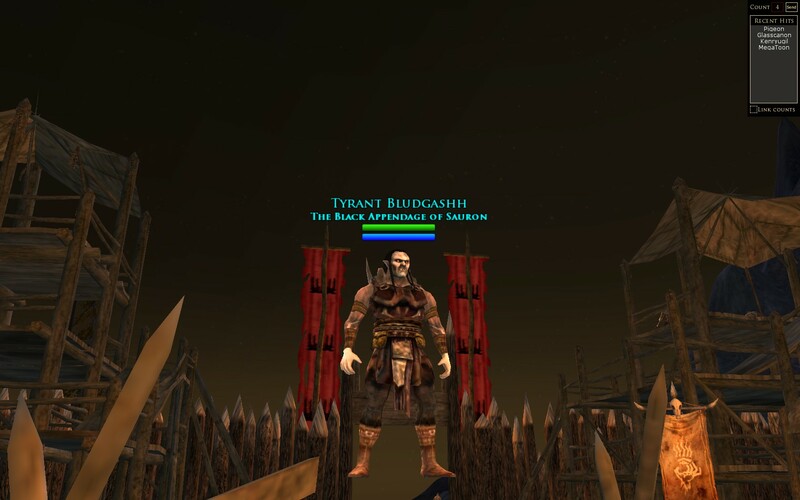 Today on the Arkenstone server, The Black Appendage of Sauron (BAOS) Senior members Bludgashh and Dreadweaver have achieved ranks 15 and 12 simultaneously off of the KB on Glasscannon Chachii near the Crude Lumber Camp Map-in. The Black Appendage of Sauron is the longest running continuously active creep tribe in the game and home to many great leaders throughout the years, including names such as Yicky, Stickeez, Hellnakh, Babyecaek, and the tribe's founder, Vyxe. Originating on the Elendilmir Server, BAOS has been at the core of the PVP community for over a decade. Those from the old days will remember the BAOS leaderboard website and creep guides. Bludgashh has been with BAOS since the first year of the game. 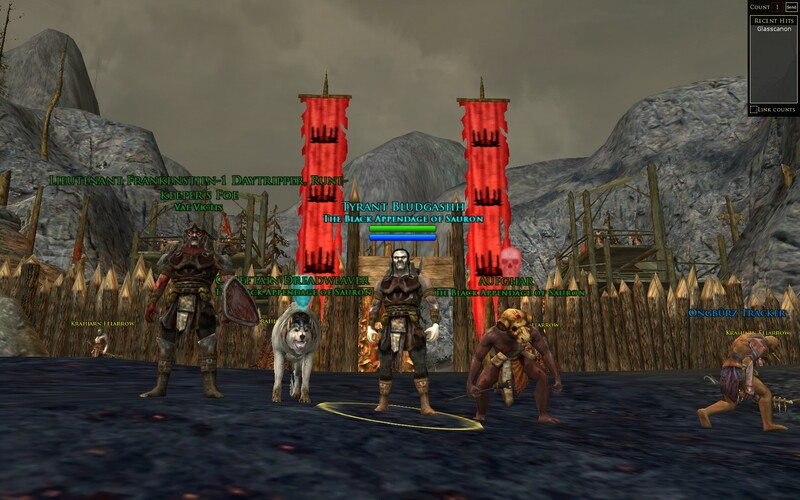 After learning about the moors from freepside chatter, he rolled a creep and after raiding with Vyxe several times, he was invited by Vyxe himself and soon rose in the tribe to become BAOS's target caller in Vyxe raids. His skill as a BA has been honed by years of fighting against the elite raiding kinships of old Elendilmir. His rank 14 was earned over 4 years ago and it has been a long road to rank 15. He is currently the leader of BAOS. Dreadweaver started off as a spider soloing around the edges of the map in late Shadows of Angmar. He slowly grew into a menace for any unprepared solo freep. After the population crash of Update 13, Dread started leading craids on Elendilmir against The Osgilliath Guard Kinship and worked to sure up the dwindling creep population against overwhelming freep numbers. 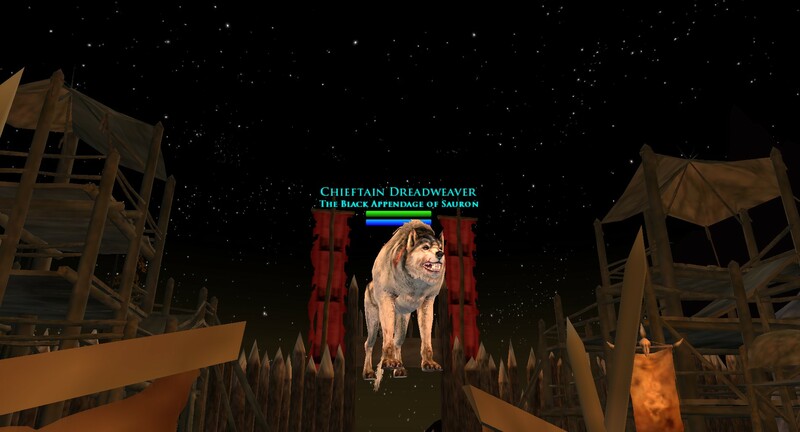 His spider achieved rank 13 several years ago, but today his warg (which has the same name) achived rank 12. BAOS Creep Strategy Guides: Already posted on the BAOS and Vae Victis discords, and coming soon to the forums and to a new BAOS website, the BAOS creep strategy guides are detailed articles that describe all the strategies, tips, and tricks regarding the play of every creep class and how to maximize every player's value to a group. BAOS Discord is a multi-tribe discord for seasoned veterans who are looking to talk strategy and generate quality non-zerg non-shuffle action. PvP Breakdown video After analyzing PvP for over a decade, BAOS will release a video on the mechanics behind PvP, including a computational analysis and systems models of PvP and balance. We hope these videos will increase knowledge of pvp and lead to a reduction in zerging and increase in the quality of small group and intermediate raid size pvp. A new BAOS website to help organize all of our resources. Last edited by Saruman_Of_Numbers; Sep 16 2018 at 07:08 PM. Congrats, Bludgashh! Big E memories and all the years fighting BAOS will last forever. Legit stole this from Karnage, shaking my damn head. Hey B! I spent a few years as part of the “overwhelming Freeps” of Elendilmir on my cappy, hunter and warden but now have been active in helping Creeps similarly on Landy. I look forward to reading your new guides and using your new software. Your help will echo across servers! Thank you for helping keep PvMP alive. Ark is where the action is, but Landy is slowly coming alive too. Good to see so many familiar names and knowing you are well. Cheers! Does your software track you was stunning you (or another Creep, normally a Warg) with Piercing Cry, thus putting up a 15% reflect on their fellowship (damage avoided/healed, and inflicted, both not credited), and following it up with a fear, rather say than bloating HpS stats when nobody needed heals atm? Totally not related to the fighting earlier tonight, it is just that sometimes an numbers obsessed autist, not you of course, needs to be hit in face with non-quantifiable on a spreadsheet to properly appreciate them. In a way it does, but not explicity. If you were to CC/interrupt a BA, that BA's damage would be massively reduced or dissapear all together during the duration of that CC. It's impossible to know what kind of dps/cc that BA would be doing during the time they were CC'ed so can't put a number on it, but its reasonable to assume that some amount of DPS was avoided on someone during that moment that could be at worst the BA's best burst rotation. To quantify that you would have to have access to the combat data of everyone in your fellowship as well as your own to determine if a drop in DPS from the creep focus was associated with your skill use. For now, if you see a creep starting to DPS on you, and then suddenly stop, only to start again 3-4 seconds later, you can safely say that was due to CC, and you can estimate the value. I will try to improve it and add features in the next version that can quantify that. Yep, lived for your leaderboards back in my Silverlode days. Bludgashh Huge Congrats and well deserved to one of the classiest players out in the Moors. So many of the old Creeps and Freeps of E would be proud. Those were such a good times in the game and you always made it good. Mudpuppy is very late too, grats guys . I was reading that there is a creep discord here on Ark how do I go about getting an invite to it? I see the Freeps are getting their excuses for their own Badness in pre U23. As expected. GIT GUD OR GIT GONE. 'What a truly disgusting thread'...this of course the one I meant. Last edited by SavileRow; Sep 07 2018 at 02:53 PM. Congratulations Blud! I'm sad I missed it! Easily one of my favourite people. Thanks for keeping me sane. I'm way late... but many congrats Blud! Now you have attained Cowlick status!